Not so many years ago, travelling abroad necessitated airport departure queues, jetlag and over-excited children threatening to do permanent damage to your eardrums. Then in 1994, the dream of hopping over to Paris in a matter of hours without having to lift off from the earth became a reality – but the dreams of profit its creators had envisaged did not. What followed for Eurotunnel, the private operator of the Channel Tunnel through which Eurostar runs, was a long battle marked by overly ambitious targets, extravagant spending and streams of debt restructuring. The transport infrastructure project that was expected to transform links between Britain and France found itself suffering from the rapid rise of low-cost airlines, reining in planned passenger targets and verging on bankruptcy. In December 2009, 2,000 passengers were trapped for 16 hours after four Eurostar trains, travelling from Paris and Brussels to London, broke down. Power was lost, cutting off air conditioning, and passengers on the trains were evacuated to a service tunnel before being taken back to France on a shuttle. A diesel train towed two of the trains to the UK. However, as the market for Eurostar gradually became clearer and the advent of High Speed 1 marked the start of a new era, the London-Paris link began to save the day for Eurotunnel (which takes revenue from Eurostar’s passengers). Eurostar’s passenger numbers and profits gradually increased, aided by big investment in new trains and new ideas. The efforts paid off; last year Eurostar hit a record-high in both passenger numbers and revenue, contributing to the 20.4 millon people who passed through Eurotunnel’s walls and the $1.5bn revenue it generated. And it seems the very mistakes Eurostar made during its journey to profitability are what will help it to survive in the future, as the train service learns from the pitfalls and capitalises on the niche it took twenty years to fully discover. In 1988, plans for the Channel Tunnel finally got underway between Britain and France, in what was meant to be a non-publicly funded project. The 50.5km track, 50m below the surface of the water, was completed six years, 13,000 workers and 11 large laser-guided drills later. But the construction project ended up being the most expensive ever at that time with a price tag of £9bn, according to Eurotunnel – almost double the initial estimate. When the Eurotunnel opened in 1994, Eurostar’s passenger numbers were estimated to hit 10 million by 1998, according to The Guardian. Those goals were hastily reviewed in the following years, with just 2.9 million passengers climbing aboard its carriages in 1995 and a gradual rise seen after that. It ended up taking nearly 20 years and a large dollop of turmoil before the 10 million target so optimistically predicted at the start could be hit in 2013. Following the privatisation of British Rail, Eurostar was sold to London & Continental (L&C) in 1996, giving Virgin travel tycoon Richard Branson, who owned a 17 percent stake in L&C, a chance to address those issues. But several years later, the problems were still continuing for the cross-channel project, plagued by what Eurotunnel’s CEO Richard Shirrefs called a “failed business model”. What’s more, Eurostar had other battles to fight – the 1990s played host to an influx of low budget airlines. Offering customers the chance to escape rainy Britain at a fraction of previous air travel prices, the likes of Easyjet and Ryanair meant bad news for the hyped-up train service still suffering in the aftermath of its overspending and ambitious forecasting. A car caught fire as it was being loaded onto a tourist shuttle, causing a 40-minute delay to the service. An HGV shuttle train caught fire inside the Channel Tunnel, closing it for six months. Another HGV shuttle train caught fire inside the tunnel, causing several hours’ closure. The airlines also had the advantage of speed. “I think the air carriers were putting that message forward to be as fast as possible”, says White. While trains travelling on the French end soared by, Eurostar’s potential success was hampered for several years by a slow, ageing railway on the London side. Yet more trouble hit Eurotunnel in 1996, when a large-scale fire from a lorry meant the freight link had to be closed down for six months. Other incidents, not least the 2005 London bombings and the financial crisis which hit in 2008, compounded the slow start for Eurostar and, in turn, Eurotunnel. With all of this to combat, Eurotunnel’s losses continued to rack up as the struggling company attempted to pay off its high-interest debt. In 2003, nine years after the grand opening, the BBC reported that Eurotunnel still had a £6bn debt and paid £318m in interest that year – almost double its operating profit (£170m). The year’s losses amounted to £1.3bn as a result of a sustained lack of demand, with Eurostar passenger numbers standing at 6.3 million, still substantially below its initial 10 million target. Profitability still seemed a painfully long way off. The same year HS1 was launched, Eurotunnel wrote a significant lump of its £6.1bn debt into other instruments, and St Pancras opened as a terminus for Eurostar. That transformed the perception of the train company according to White, who said the station became “one of Eurostar’s biggest marketing tools”, replacing worn-out Waterloo. The effects of HS1 were evident; Eurostar’s operating losses fell 25 percent to £96.3m in 2009 (partly as a result of lower fees to use HS1). Shareholders in Eurotunnel, meanwhile, finally received their first dividend – originally promised for 1995. The Channel Tunnel, named one of the ‘seven wonders of the modern world’, was finally living up to its potential. When Eurostar restructured its model in 2010, with the three separate firms responsible for each territory (French SNCF, Belgian SNCB and British LCR) changing to become a single entity, the strategy changed again. Learning from the previous failed model, the new unified company split 55 percent, five percent and 40 percent respectively, led the way for a host of ambitious plans in the battle against air carriers as the company continued to pull out positives from its past mistakes. Among those plans, a scheme emerged to purchase a new fleet of Siemens trains and to refurbish its older ones in a capital expenditure programme worth £700m, financed by a 15-year revenue risk loan. The acquisition, which will see the new fleet implemented in 2015, is set to increase capacity by 20 percent, providing space for 900 extra passengers in order to meet promising signs of increasing demand. This has enabled Eurostar and Eurotunnel to turn their bleak image around – Eurostar reported its first operating profits as a standalone business in 2011 (£25m), with revenues from its 9.7 million passengers exceeding £800m, according to Eurostar. The following year, revenues more than doubled, hitting £52.3m, aided by Eurostar’s sponsorship of the London Olympic Games. But it wasn’t a one-off; in 2013 sales climbed seven percent, while operating profits rose another four percent. The train service had found its niche – one which avoided the tiresome departure queues, x-rays and uncomfortable frisking of airports – and started to capitalise on it. Eurostar focused on targeting two clearly distinct demographics – leisure and business – moving away from the vagueness which defined its early life and once again using its mistakes to improve its offering. “Now it’s very clear that it’s capital-to-capital, as fast as possible, but actually leaking in with a wider transport service”, says White. Eurostar’s original fleet consisted of 27 trains, built by French company Alstom. They are expected to be in use until the late 2020s, following a €100m renovation project. The sale of the UK Government’s stake forms part of a plan to privatise £20bn of state assets by 2020. 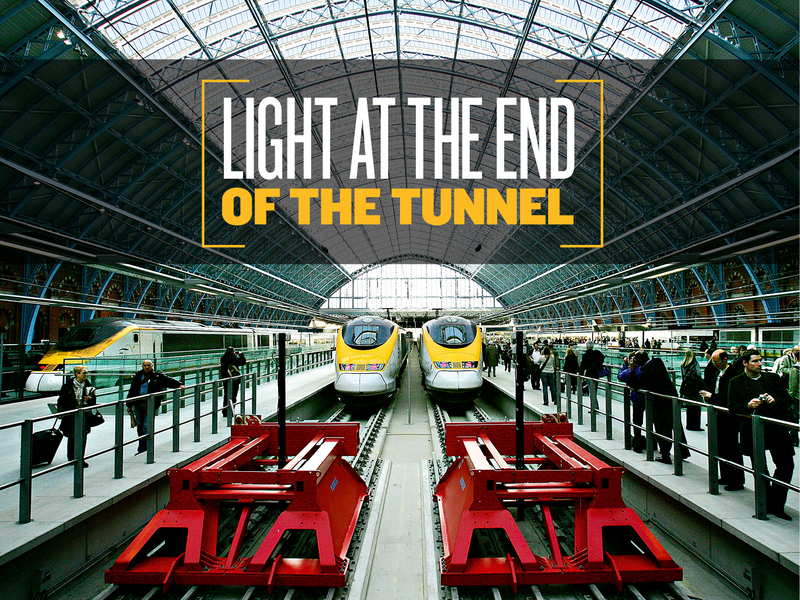 Up to 400 trains cross the Channel Tunnel every day with an average of 50,000 passengers. The tunnel also sees a daily average of 180 coaches, 6,000 cars and 54,000 tonnes of freight. 38,000 passengers tried out Eurostar in its first month of operation in 1994. In the wake of its turnaround, Eurostar has started to grow its network of destinations, adding the Swiss Alps to its list in 2013. In July 2014 it announced the launch of a direct London to Marseille connection, to be opened in May 2015, predicted to take just over six hours. That’s likely to open up the South of France as a more viable destination for short leisure and business trips, bringing Britain ever closer to the Mediterranean. The company is set to extend yet further in December 2016 by launching the first direct train from Britain to Amsterdam. CEO Nicolas Petrovic is optimistic this could transform business and tourist travel. “With over three million passengers travelling by air between London and Amsterdam, this is one of Europe’s most popular routes”, he said in a statement announcing the news last September. “Our fast, comfortable, point-to-point service will greatly enhance the links between the UK and the near continent, revolutionising travel between these important financial and tourist hubs”, he added. This could further improve prospects for Eurotunnel and strengthen evidence that the initial turmoil stirred up by the Channel Tunnel was worth it in the long run. “We will be comparable to the low-cost airlines for the best prices”, Petrovic claimed. Taking a more airline-focused approach seems to be something the company is doing visually too – this year Eurostar announced the first new staff uniforms in a decade, displayed on the notorious Paul Day statue The Meeting Place at St Pancras. Designed to match the new trains with a navy blue and yellow colour scheme, they reflect “more of an airline image” according to founder of design firm Jermyn St Design. This formed one of a succession of initiatives announced by Petrovic in 2012 as part of Eurostar’s evolution. The Channel Tunnel is likely to undergo further changes if it is opened up to other rail companies such as Deutsche Bahn – an idea floated numerous times of late. 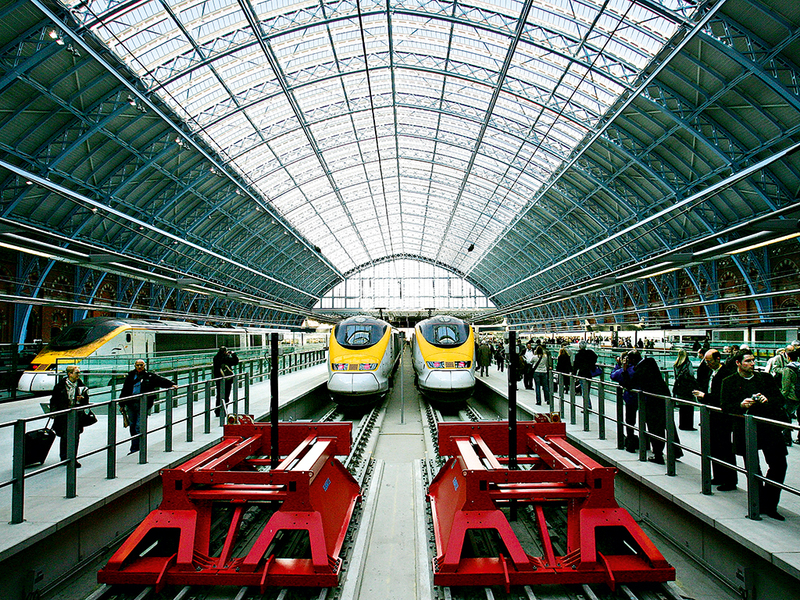 If that happens, some have argued that Eurostar could suffer in the face of new competition. But ending the train company’s monopoly over the channel tunnel doesn’t mean ending its success, given that it’s likely to serve a different set of destinations. What it does mean is increased opportunities for rail travel abroad, bringing the UK closer to the rest of the continent. That’s something Dieter Helm, Economics Fellow at Oxford University, agrees with: “Over the next 20-30 years it only needs a little imagination to think you will be able to get on a train in any city in Europe and go to any other city.” As Eurostar learns from its past mistakes, reaps its relatively newfound profitability and leads the way for other rail companies to expand the network of destinations accessible from the UK, that vision is starting to seem increasingly possible. 13,000 workers were involved in the construction of the tunnel. 10 of them were killed. At 31.4 miles long, the Channel Tunnel is the 11th longest usable tunnel in the world. It stretches 23.5 miles undersea, giving it the longest undersea portion of any tunnel in the world.